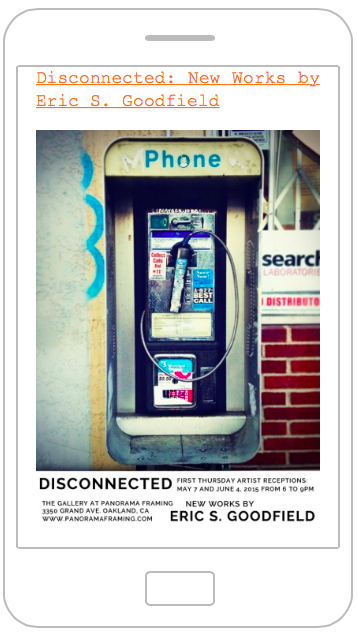 Disconnected: New Work by Eric Goodfield - Panorama Framing, Inc.
“Several years ago I took a picture of a payphone with my iPhone. The light was just right. The phone was just right. Everything was exactly as it was supposed to be. At that moment I realized: This is the end of an era. I had just taken a picture of a payphone, with the thing, a cellphone: the thing that had made it obsolete. The thing that killed the thing. I’ve been taking pictures of them ever since. I am a videographer by trade. That is, people pay me to shoot various projects for them. My work takes me all over the country, and on occasion, other parts of the world. I usually do two things when I arrive in a different city: First I go for a run. It’s one of my favorite ways to see a new area. I’m always looking to find interesting new sites, hole in the wall bars and promising restaurants. A run is a great way to get an on the ground look at the area where I’m staying. Second, I’m always on the lookout for payphones. I plot out a rout and a time best to shoot each one. 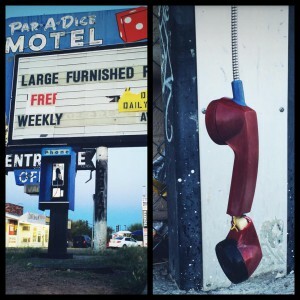 When hunting for phones, I look for neighborhoods that seem forgotten, and maybe even neglected– places with character. When I head out, I’m not always sure whether I’ll find a phone. Sometimes, the phones are there, and nobody even sees them– people look right past them, because they’re of no relevance anymore. Even if I only find the remnants of payphones there’s meaning in that. The sheared bolts from a former payphone base sticking out of a cement block, or a wire coming out of a wall– these are the things we overlook, that are part of our disappearing landscape. Usually, the phones are as neglected as the neighborhoods I find them in. Bankrupt or irresponsible companies have removed the phone but abandoned the housing, leaving a post or a shell a scrap metal remnant. I love it when artists reclaim and repurpose these fixtures with stylized graffiti, portraits and intense colors somehow making it their own. In airports, I see banks of payphones with just one phone working or converted into video rental spaces, cellphone recharging stations, or free computerized phones with nonstop visual advertising.